The Shenandoah Valley is the perfect location for a weekend getaway. Made famous by the song and movie of the same name, Shenandoah is an Indian word meaning "Daughter of the Stars". There is an endless variety of things to do here from the incredible scenery, famous caverns, acclaimed wineries, historical sites, Civil War and Revolutionary War battlefields, antique shopping, and let’s not forget canoeing on the majestic Shenandoah River. Front Royal, VA, has been designated the Canoe Capital of Virginia. So if you enjoy hiking, canoeing and other outdoor activities, come to the Shenandoah Valley. The Shenandoah Valley of Virginia is ideal for a weekend of colorful leaf peeping. Usually about mid-October the mountains begin to shimmer with the reds and yellows of the maple, oak, hickory and dogwood trees. The Blue Ridge Parkway runs from North Carolina to Waynesboro, Virginia, where it becomes the Skyline Drive. 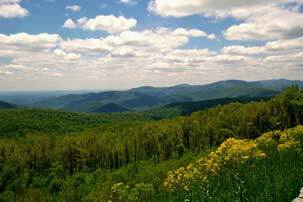 The Skyline Drive runs for 105 miles through the Shenandoah National Park, and terminates in Front Royal. This stretch of highway is one of the nation’s most beautiful and intriguing stretches of road. The entire drive is dotted with beautiful overlooks and spectacular views. A list of other restaurants in the area can be found here.